Spectra Ensemble asked me to write a comment on the first movement of Beethoven's last string quartet, Opus 132. Out of esteem I decided not to go standing too close to the master. Instead, in Cloud Chamber I am looking at Beethoven from a distance. Like his contemporary Kaspar David Friedrich puts the ‚Rückenfiguren’ in his paintings as a small silhouet, in rear view, and as part of a vast landscape. 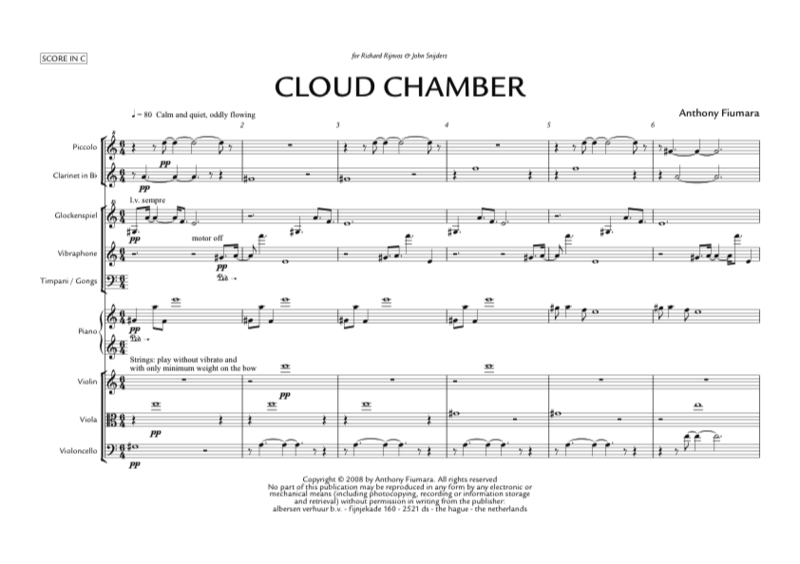 Cloud Chamber was commissioned by Spectra Ensemble. The work is dedicated to Richard Rijnvos and John Snijders.